If you’ve ever attended a Catholic wedding, you know the Church does weddings a little differently than other traditions- there are certain things we do and don’t do. However, if you are a Catholic in the United States, chances are you may not know that the Church has different marriage rites, depending on the liturgical rite a couple belongs to. I barely knew myself until I was planning my own wedding in the Byzantine rite. For every liturgical rite in the Catholic Church (there are over twenty!) there is a different liturgy of marriage in keeping with the rite’s tradition. Last December, when I was married in the Byzantine rite, I had only once attended a wedding in the Eastern Catholic Church and needed plenty of instruction. I had been officially welcomed into the Eastern Catholic Ukrainian Church the previous June after requesting a change of rite (from the Latin rite in which I was raised). It was during my studies abroad in Rome that I stumbled upon the Byzantine rite through association with the Russian Catholic Church established there on the Esquiline hill. I was initially attracted by the beauty and depth of the liturgy (although I didn’t know any Russian!) and after further study of the history, iconography, and spirituality of the East, I knew that I wanted one day to embrace that patrimony as my own. Upon returning to the United States, I had the opportunity to do so and my husband-to-be was very supportive (and curious) about marriage in the Eastern rite. Despite our inexperience and our guests’ unfamiliarity with the Eastern celebration of marriage, everyone was touched by the unparalleled beauty of the rich symbolism behind every gesture and edified by the solemnity of the rite. Much to the surprise of our guests, my father did not accompany me down the aisle. Instead, my husband and I processed hand-in-hand down the aisle behind the celebrants. By entering together, we crossed over the threshold of the church as equal partakers in this unfolding mystery of love. The focus is not on the bride alone, but on the couple, already becoming one mind and one heart as they make their way into the House of God. The marriage rite actually begins in the vestibule of the church with the service of betrothal that confirms the free will and intent of the bride and groom. Although we were already betrothed (more on that later), we reaffirmed our free and unconstrained consent to enter into the marriage covenant. As soon as we had publicly professed our intent, we were prayed for by those around us. The Byzantine liturgy is sprinkled with intercessory prayer: for the soon-to-be spouses, for blessings upon their marriage, for the fruits of the bride’s womb, for the couple’s children and their children’s children. Drawing upon a rich array of biblical marriages, the priest then offers a prayer to bless the couple like the biblical couples from Adam and Eve to Mary and Joseph. By being prayed over with such powerful imagery, the new couple becomes a part of the biblical story of redemption and a link in the genealogy of Christ’s second coming. To seal their participation in the story of salvation, the bride and groom are now invited to place their right hands on the Gospels. The priest then covers their hands with his stole as the groom followed by the bride read their marriage vows. Both my husband and I appreciated that we were not asked to repeat the words of the priest - we read them for the first and only time directly off the page. The vows were simple and profound, undergirded by the promise to love, respect, and be always faithful to our spouse with the help of God and all the saints. The crowning is most certainly the most dramatic part of the ceremony, not only for the spouses who are trying to keep their heads upright, but for the whole assembly that witnesses a new dimension of marriage that is not typically highlighted in a wedding. The crowning is not some sort of mock celebration of how the newly wedded spouses might feel on top of the world but instead the “crowns of glory and honor” placed on their heads symbolize the honored martyrs who shed their blood and gave their lives for Christ and their neighbor. Like the crown of martyrdom, the crown is a prize of a marriage well-lived: a crown of sacrifice and self-giving. It is a foretaste of a glorious marital end! The Byzantine marriage rite is not celebrated within the context of a eucharistic celebration. However, a chalice of unconsecrated wine is offered to both husband and wife, symbolizing the bitter and sweet moments of married life that they will share together. This is followed by a final ritual journey when their hands are joined with an embroidered cloth and bound to one another, the couple is led around the tetrapod - a symbol of Christ - three times, by the priest carrying the Gospels. Again, the couple is starting their journey together by following the Word of God with Christ as the cornerstone of their life’s foundation. The concluding prayer invokes God’s blessing on the couple until their crowns are received into God’s kingdom. 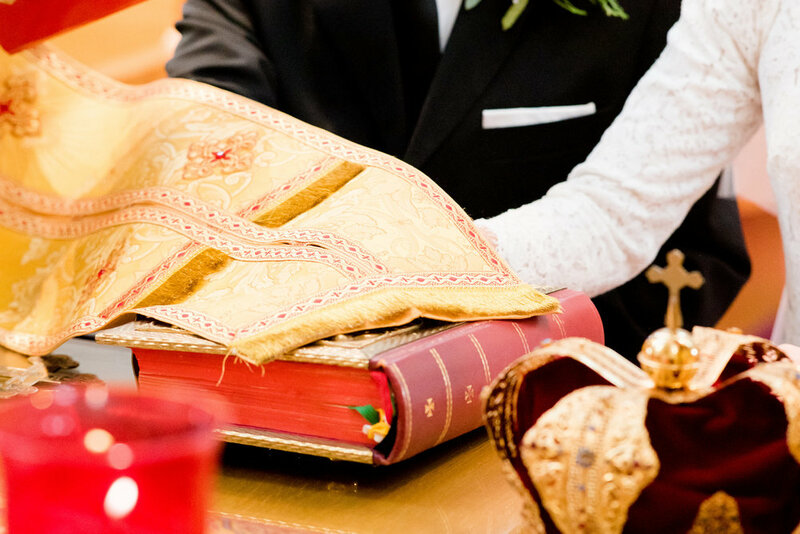 In every Catholic liturgical rite, marriage is a sacrament that places you on a life journey of complete self-giving (and hopefully, a crown will be your prize!). Francis and I began our life journey walking as a couple over the threshold of the church and hope to journey together towards the Kingdom of Heaven while building our domestic church day by day. Regardless of rite or tradition, all Catholics are building the same Church - in their marriages and homes - each in their own way. This is the beauty of the Church: its unity and its diversity. 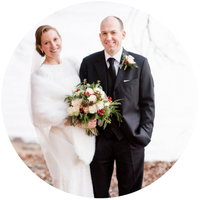 About the author: Julia Dezelski is currently finishing a doctorate in Theology. Her areas of interest include marriage and family, consecrated states of life, and the feminine genius among others. Julia was married last December in Washington, DC and can’t wait to cuddle with her first child due in January.